Please click below for a presentation from ABCmouse.com Senior Curriculum Advisor and 2006 National Teacher of the Year, Kim Oliver Burnim! 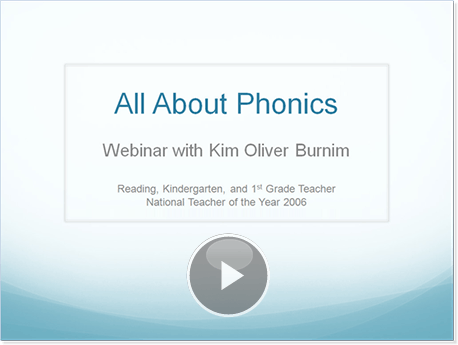 Why do parents need a webinar on phonics? How does phonics fit into a reading program? Why is it important for children to learn phonics? How does phonics help with overall reading success? How can parents help with phonics? What is your recommendation for kids learning two languages, Spanish as the first and English as the second, at the same time? Thanks. For children who speak a second language and are literate in their first language, that knowledge transfers more easily when they’re learning the second language. Do all that you can in the language the child is fluent in and that knowledge will transfer as he learns the second language. If you’re teaching both at the same time, one parent could focus on one language while the other parent focuses on the other language. That way the child has the ability to learn both languages at once and make a distinction between the two. Use your child as a guide. If they seem overwhelmed, then slow down. And if they’re doing well and are interested, then continue with both. I have a 4-year-old grandson who is reading text at approximately a third grade level. Shortly after he turned 4, he just picked up an easy reader and took off. Other than his parents continually providing him books to read and also reading to/with him, what else do you suggest? Should they have a conversation with his upcoming regular ed teachers? It sounds like you’re doing a lot of the right things at home to have a 4-year-old reading at a third grade level. You definitely want to talk to your child’s teacher about the things he can do and also about what some of the other things are that he can learn to make his reading a little stronger. It doesn’t matter what level you’re reading on, there’s always room for growth. Maybe he has already mastered phonics, but the teacher can help guide him and focus on another aspect of reading such as comprehension and being able to use the information he uses in books to do other things. Do you consider learning to “sound out” a word or memorizing sight words to be the best way to learn to read? Children need to learn both in order to become good readers. It’s important that they learn to sound out words, but it’s also important that they can recognize sight words, which are those words that children can’t sound out, such as the word “of.” It’s important for children to read the sight words automatically because they are the words children are seeing most frequently while reading. The child also needs to be able to sound out tricky words on the page. My 8-year-old son has moderate to severe dyslexia and is reading at a 1st grade level. How can this program help with his problem? I’m not trained on working with dyslexic students, so you should speak to your child’s teacher first. Try finding your child’s strengths. There’s something everyone does well, so find what that is. For example, maybe he uses visuals to help him, so find books that have strong visuals that will help him as he’s learning to read. Maybe he understands things better when they’re nonfiction. Make sure the books you’re using are of high interest; find what he does best, and build upon those strengths. Your child’s teacher will give you tips on how the child learns best in the school environment, and that can transfer to learning in the home environment. I have an almost-4-year-old who has been diagnosed with ADHD. What should I do in order to help teach reading and phonics while considering a shorter attention span? Any tips? Most 4-year-olds have short attention spans. It’s part of being a 4-year-old boy or a 4-year-old girl. Children learn best through short, repetitive learning. They may sit down for just four minutes to practice sounds or play a game. Limiting activities to a short amount of time, but repeating the activity would be beneficial. If, for instance, you were teaching the letter d, you could start by focusing on the letter in a book, then play a game, then next time practice writing it. Keep it short, fun, and do it over and over again—that’s how children learn best. The activities on ABCmouse.com are designed to be short so that you can do one or a couple at a time and then move on to something else. Where is the phonics module located in ABCmouse? The phonics activities are found throughout the site and on the step-by-step learning path, but you can also find many phonics activities broken down by letter in the BASICS section. I teach literacy to preschool children, ages 3½ to 5. Many think that this is too early for literacy education, that the children who graduate from my literacy program—reading at a first to second grade level—will be bored when they enter kindergarten, and therefore view this ability as a liability rather than an asset to their academic success. What are your feelings on the matter? If children are ready to learn and show a desire to learn, then we can do it as long as we do it in ways that are age– and developmentally appropriate for that child. I think one of the joys and dilemmas of being a kindergarten teacher is that children come in at multiple levels. You may have one child who doesn’t know any letters and another that is reading on a first grade level. One of the signs of a good teacher is that they’re able to differentiate among those learners. Teachers should be working with students in small groups so that they can address those individual needs. You may have a group of students who are reading at a first grade level, but during that small group time, they’re getting instruction that’s tailored to their needs. The teacher is helping the child move their reading to the next level even if they’re above grade level. How do I help my child to read fluently? To read fluently means to read words expressively and smoothly. Children who are not fluent read choppily and word-for-word. This can affect their comprehension, because they don’t remember what they have read by the time they reach the end of a sentence. Reading fluently is an important skill. To help your child learn to read fluently, one of the most important things you can do is to regularly read aloud to your child so that you’re modeling the type of reading you want your child to do. For example, if you’re changing your voice for different characters, your child will know that he or she needs to do the same. If a book that you’re reading has text features such as bold print, and you decide to read a bolded word loudly, you’re modeling that they, too, can do that while they’re reading. Another way to develop fluency is to have your child read a book over and over again. Children tend to become fluent readers after reading the same thing many times. They know when to pause, when to speed up, and when to slow down. As they listen to themselves read more and more fluently, this also helps to build their confidence. My husband and I attended our son’s first kindergarten parent-teacher conference yesterday, and his teacher advised that he needs help with phonics, specifically in identifying certain sounds (e.g. if you remove the t in cart, the new sound is car). He will be tested on this again in February. What would you recommend that I do to help him develop this skill at home? It’s great that you’re being proactive in helping your child in an area where he needs a little more support. I think that learning about word families would be a good place to start, because the teacher is describing a way to manipulate sounds and change words around. You may want to start with the –ar family and work on words such as car, bar, and far. The child can practice moving letters around and making new words. You can write all of these words on a piece of paper and cover up only the first level. Ask the child what they would do to change a word from car to far. Eventually the child will recognize the short word car and be able to add letters to the beginning or end of the word to expand upon it. You can also ask the teacher for suggestions in finding activities you can work on at home. Also, I’d direct you to ABCmouse.com and any of the word family activities we have on the site. My son knows all of the letters and the sounds they make. He can look at a word and sound it out, but is not yet able to recognize the sounds as a word. What is the next step to getting him to actually read a word? Am I expecting too much too soon? Reading has to be connected to meaning, so try using pictures with individual words or flashcards, because that will be more engaging and have more meaning to him. Young learners need a lot of support, and doing things visually will serve as a bridge to move to the next level. You can also help him sound a word out by helping him blend the sounds together. For example, if he knows the sounds of the letters in the word “bus,” have him repeat those sounds (“b,” “u,” and “s”) over and over until he can say them fast enough that he recognizes the word he’s saying. My daughter is 3½ and she has been out of school for the last 8 months. I need to know where I should start to get her caught up with the other kids her age and to help her stay on track. What things should a 3–4 year old know by that age? There is no specific level that a 3½ year old should be at, but ABCmouse.com is a good resource to utilize for understanding the typical things a 3½ year old is learning and working on. You can start your child on the beginning learning path, and that will help you figure out the progression of letters your child can work on and what activities are developmentally appropriate. If you’re reading books with your child at home, pointing things out at the grocery store and the park, and speaking and listening to your child, they’re going to be on the right track. I was a very good reader before entering kindergarten. When my school introduced phonics in 2nd grade, I found it to be remedial and “busy-work” to have to sound out words and do repetitive worksheets. It was the beginning of my boredom with school that lasted through grade school and middle school. How do I avoid the “boredom” factor with my own 4-year-old, who is already a pretty good reader, when he is in reading/phonics classes in his upcoming school years? You are right to be an advocate for your child, but we can’t assume that our children are going to be the same way that we were. There are so many things that are different for our children today than when we were in school. The first step would be to be an advocate and cheerleader for your child. Let your child’s teacher know what your child can do so they will know what types of activities he or she can do to enhance your child’s learning. There are many different levels of phonics instruction so even if he has mastered one level, it doesn’t mean he doesn’t have many other things to work on. My 8-year-old has problems with the issue you described in your ‘t-ow-er’ example. She has been diagnosed with dyslexia and has repeated first grade. She is choppy and not very fluent, but she has made great strides. Her understanding is surprisingly good, and her confidence is getting better. I recognize her struggles in your example, though. She may read the word as ‘t-oh-er’ and then exclaim, “THAT DOESN’T MAKE SENSE!” How do I get her to go back and sound the word out correctly? We have to do multiple things to help children become good readers. One of the things your child is doing well is that she’s recognizing some of the patterns that words make. You can help her to move forward by teaching her other spelling patterns. If she’s working on the –ow pattern, you can talk about how sometimes it makes the sound as in know, and sometimes it makes a different sound, as in cow. Once children learn there are different ways and sounds that letters make, they learn to use them. They have to learn to be flexible and fluid with their use of vowels and other letters. We can teach them the different sounds that letters make, but we also have to key them into the meaning of the text. We need to teach them to always ask themselves, “Does this make sense?” If it doesn‘t, they need to learn to go back and start over. This is something we can model and guide them in doing. Ultimately, they need to learn to do it on their own. By modeling and instructing, they’ll be able to monitor the meaning of their reading. How young is too young to start teaching our child about phonics and sight words? I don’t think there’s a time that’s too young or too early to begin learning. But every child is different, so use your child as the guide. If a child shows interest in letters, words, and books and is asking questions about the letters, then I think that child would probably be ready to start learning about phonics. I’ve found in my own family that my niece was ready earlier than my nephew was. It varies from child to child, and there’s no right or wrong time. However, children should definitely be learning about basic phonics and sight words in kindergarten. What is the best way to teach phonics to students with special needs, who may have difficulty distinguishing the letters b and d? I think it’s difficult to distinguish the letters b and d for most children, whether they have special needs or not. Lowercase b and d look very similar and can be very difficult for children to distinguish. I will usually not introduce letters that sound or look similar at the same time. I let them get a solid understanding of one and then move on to the other. They’ll learn to figure it out. Many of the techniques used to instruct young children work well for children with special needs, children without special needs, and older students as well. Try to get them involved in as many ways as possible. You want to present things visually, use language in engaging ways, and try kinesthetic activities as well. Get them up and moving and engaged in what they’re doing. For example, if they’re working on the letter j, have the child look at it, jump, and use words and pictures that are visually appealing to help get them involved in the process. ABCmouse.com is a great resource because it’s visually appealing and engaging, games are short, and it provides a lot of repetition. Children can work at their own pace and, when they’re ready, can go back and try other activities. There are many things children do on the website that you might try yourself using tangible materials in your home. I have a 3-year-old who is extremely intelligent but gets distracted easily and a bit frustrated if he doesn’t get things right away. How do I keep him focused? This is very typical of a 3-year-old because they’re interested in so many different things. I would say to keep activities short and interesting. Make sure your child is successful in what he does. It’s probably not best to quiz your child at this time, but build opportunities to be successful. An example of this is saying, “This is the letter c. What letter is it? You’re right, this is the letter c.” You’re not expecting the child to do things on his or her own, but you’re building the support for success. If they’re frustrated, stop and come back at some other time, and try it in another way. If you know what frustrates them and you know you need to change it up, make it into a game or an activity where they can move around and do different things. Most of all, just make it fun and short. If your child isn’t ready at 3 years old, it’s not too late. Maybe you need to wait until they show a little more interest. That’s perfectly OK too. My child knows all the phonics sounds very well, but blending the sounds is taking time. How can I make blending sounds interesting? It does take time. Learning sounds seems like the easy part, and blending can be a little more difficult. I would try doing things orally. You can play games with your child wherever you are. You could try describing things that are in your house, and have them guess what you’re talking about. For example: “I see a “k”– “uh”– “p”. What is it that I’m talking about? Blend it together. Oh, it’s a cup.” Then you can have the visual support of the cup in front of you. Eventually they‘ll learn to play that game and take words apart and put them back together. It doesn’t have to take long. You can do it for a few minutes at a time while you’re getting dinner ready. That would be a good way to start. My child, who is 3½ years old, is receiving speech therapy at day care. What can we do at home to improve his speech? He loves movies, but is not really interested in books or the computer at the moment. It’s important that your child is engaged while learning, so starting with what interests him would be best. If he loves movies, talk with him about what he’s seeing. Ask him questions such as, “Why is she your favorite character?” or, “Why do you think he’s feeling that way?” Having the opportunity to engage in conversation will help him develop speech skills and oral language skills and require him to do some critical thinking. If you’d like to connect his speech to phonics and reading, try finding a print version of his favorite movie at your local library or work on recognizing letters and sounds within the name of his favorite characters. You can also make puppets of the characters from your child’s favorite movie. Have your child pretend to be a character by using the puppet. He can practice saying things that the character says in the movies. You could even work towards doing your own “family skit” using the puppets. My daughter is 4 years old. She can read, but gets very bored if we’re working on a set of words or if the book is repeated. What would be the best way to help her maintain her attention? To help maintain the attention of young children, try limiting activities to only a few minutes at a time. Try doing activities that are related to a particular book instead of just reading the words cover to cover. These activities could include having your child find specific words and using post–its to mark the pages in which they’re located or playing go fish, bingo, or word’matching games using a particular list of words. Utilizing a wide variety of text could also help keep her attention. Along with books, try introducing her to different forms of print such as magazines, comics, and newspapers. Hi. My daughter is 3 and has been reading for a year now. She started reading the preschool prep books. She can read about 208 words. Most are sight words. What should I focus on having her learn next, blends or diagraphs? Also, what do you think of the hooked on phonics program? I bought it, and she’s at the kindergarten level. Do you think it would be good to continue with the phonics series? If most of the words your child can recognize are sight words, you should also spend time working on letters and their corresponding sounds. After your child learns the sounds represented by each letter, she will start to decode words. She will recognize that the sounds each individual letter makes can be blended together to read new words. This would also be a good time to introduce letters that have multiple sounds such as vowels. Additionally, try introducing word family words, which are words that share common letter combinations such as cat, bat, and flat. I have a four–year–old who will be five next month. It’s hard sometimes for me to get him to do his lessons, only because he’s in pre–k now, and every time he comes home he always says he plays all day at school. But I have a three–year–old and she loves doing these lessons. How can I make him want to do these lessons? Many children don’t realize that their play time is actually learning time. Your child may be engaged in academic related activities at school, but he’s having so much fun while learning that he doesn’t view it as work. When trying to get him engaged in lessons at home, start with activities that align with his interests. If he’s interested in animals, try having him explore the ABCmouse.com farm and zoo environments and the learning activities that go along with them. You can try turning his “lessons” into a game as well. For instance, if you want him to practice reading words from a word family, draw them on a hopscotch board with sidewalk chalk and have him read the words while playing hopscotch. Also, remember to limit the time spent on these activities. He may respond better when he’s presented with lessons for only a few minutes at a time. I have a 3½ year old that loves books and wants to read. I am not a good reader and don’t pronounce some words correctly. How do I make sure my daughter becomes a better reader than me? One of the most important things you can do is to be positive and remain engaged and interested in your child’s reading efforts. Spending time reading and talking together will help your child continue to develop a love for books and learning. By providing continuous exposure to books and having your child practice phonics–related skills, your child’s overall reading skills will continue to develop. If you’re worried about your pronunciation, try listening to books on ABCmouse.com and practice repeating the words together. My daughter is 3½ and knows her letters and sounds but struggles with making the sounds into words, so I show her the picture, and she “cheats” and just names the picture. Is she lazy or just not ready to read? Using picture clues is a reading strategy that will be very useful as your child begins reading more complex books and words. Learning is actually enhanced when pictures and sounds are used together. If your child knows all the letters and their corresponding sounds, then she needs practice blending those sounds together. Be patient and know that it does take time. How do you motivate a five–year–old child to read, when that child is a fluent reader but loves being read to? Many children enjoy being read to because they love to listen to the stories and let their imagination make it come to life. That’s harder to do when they’re doing the reading independently. In fact, there are many benefits from listening to books read aloud, even for fluent readers. One benefit is that children hear richer and more complex stories, which can help increase their knowledge about the world and improve their vocabulary. Additionally, you can model a love for reading, which you ultimately want to instill in your child. Try taking turns while reading. You can switch every page, every chapter, or every other book. Your child should know the letter names and be able to identify capital and lowercase letters. It’s okay to begin introducing the sounds represented by each letter as you introduce it, or you can continue teaching letter recognition before introducing the letter sounds. Regardless of when you decide to introduce phonics, your child will develop a love of reading simply by interacting with you as you make learning a part of your daily routine. ABCmouse.com is constantly releasing new material to keep your child engaged and interested. You shouldn’t need to purchase any additional learning tools. She will continue learning phonics through exposure to books and rich language in your home environment. Is it ok that my 3–year–old daughter invents stories and pretends she is reading? Or should I teach her what the books really say? Yes, it is OK for a young child to pretend to read. When young children invent their own stories and pretend to read, they develop important pre–reading skills. Not only will she learn concepts of print such as how to hold a book or how to read left to right and top to bottom, but she’ll also learn that words portray meaning. She’s showing an interest and love for reading by creating her own stories and pretending to read. Next time she pretends to read, use that moment as an opportunity to talk about the words she’s reading or the letters she sees on the page. What if I didn’t send my kids to preschool? There are many benefits to a quality preschool program. However, every parent needs to decide what is best for his or her own children. Your children do not need to attend preschool in order to be prepared for phonics. There are many things you can do at home to make sure your children are on track and ready for kindergarten. Prior to kindergarten, your child should have experience with identifying the letters of the alphabet and recognizing the sounds that each letter represents, and they should show an interest in books. If you tune in to the webinar, I provide a lot of suggestions for working on phonics at home with your child. By following some of my advice, your child should be ready for formal phonics instruction by the time he or she reaches kindergarten. Can ABCmouse.com be incorporated into a homeschooling setting? ABCmouse.com can absolutely be incorporated into your homeschooling curriculum. It can be used as an easy way to supplement and enhance the tools you’re currently using while also helping your child become comfortable using technology. ABCmouse.com makes it easy for you to find lessons and activities to expand upon your child’s current level of understanding while making learning fun. For example, if you’re teaching your child at home about the letter Aa, you could use ABCmouse.com to access songs, printables, books, and games that help teach letter recognition and the sounds represented by the letter. Would you teach a child phonics in the same way you normally would while you are trying to teach them two languages (such as English and Spanish)? Or would it be a good idea to teach them both simultaneously, such as a - apple - manzana? For dual language learners, it is best to separate the language delivery. Parents should not be teaching them “side–by–side”; we call that concurrent translation. It does not allow for the child to adequately learn the target language since he will be waiting for his language so that he can make sense of it. In English, the phonics lessons are broken up into consonants then vowels, but in Spanish, teaching usually begins with the sounds of the VOWELS because they are consistent, then the consonants are added. The consonants and the vowels thus make up a syllabic approach which is a bit different than English, but the words like: ala, los, are really sounded out like: a-la and one closed syllable: los. Other words such as ma–ma, pa–pa, ga–to, ar–bol, ven–ta–na are taught by syllable and it is a slightly different process. But separation of the two for phonics is very important. 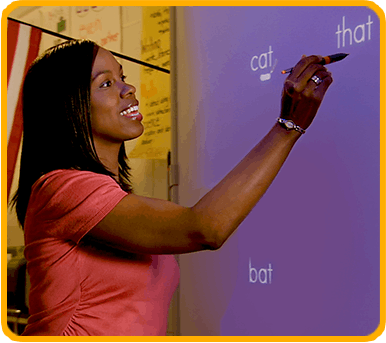 Do you recommend learning phonics first, sight words first, or both at the same time? Children need to learn both in order to become a good reader. It’s important that they learn to sound out words, but it’s also important that they can recognize sight words, which are those words that children can’t sound out, such as the word of. It’s important for children to read those sight words automatically because those are the words children are seeing most frequently while reading. You can introduce sight words to your child as you find them in books. I understand about children being behind, but what do you do about those who are considerably ahead of the others in their age bracket? My 3–year–old child is currently reading at a 1st grade level, and I do not want her to go backward once she enters school. In the beginning of the year, talk with the teacher about your child’s strengths and what you have been working on at home. Share your concerns, but also share your hopes and goals for your child. Most teachers start the school year with a pre–assessment to determine your child’s reading level. This assessment will help guide the teacher’s instruction. Remember, it doesn’t matter what level you’re reading on, there’s always room for growth. Meanwhile, continue to read to and listen to your child read on a daily basis. What is the best way to keep a 1st grader focused on his work? Children learn best through short, repetitious learning. Try having your child sit down for just a few minutes at a time to practice sounds or play a game. Limiting activities to a short amount of time, but repeating the activity would be beneficial. Picking activities that support your child’s interests is a great way to motivate them to stay focused. For example, if your child is interested in animals, pick activities that allow them to practice academic skills while also learning about something that’s interesting to them. ABCmouse.com contains a large range and variety of activities, games, books, puzzles, and songs to help children remain engaged and excited about learning. Finally, I would suggest incorporating choice, so that your 1st grader has some ownership over his work. My child just turned 3 and is reading entire books on his own, counts to 100, and adds & subtracts. He’s very social already through library visits, reading programs, and playground visits. In a year, he’ll enter kindergarten. Does it make sense for him to skip kindergarten? Children learn many important concepts in kindergarten other than just academic related skills. Many children learn how to wait in a line for the first time, how to navigate around the school, become familiar with school workers, how to form friendships, etc. One of the signs of a good teacher is that they’re able to differentiate among learners. Teachers work with students in small groups so they can meet individual needs. It is typical to have a group of students who are reading at an accelerated level in each class, but during that small group time, they’re getting instruction that’s tailored to their needs. The teacher is helping the child move to the next level even if they’re currently above grade level. Although your child may be strong in some areas, the teacher will find additional areas that need growth and development. Talk with your child’s teacher to determine how you both can work together to meet the needs of your child. How young (age) can phonics be taught? Each child is different, but use your child as the lead. If a child shows interest in letters, words, and books, and asks you questions about the letters, then I think he or she is ready to learn phonics. I wouldn’t expect that to happen too early; it varies from child to child, and there’s no right or wrong time. However, children should definitely be working on phonics and sight words by kindergarten. How do you encourage a first grade student to join the sounds of letters to make words? It varies for each child, so use your child as a gauge for what he or she needs. Reading has to be connected to meaning, so maybe working on words in isolation has no meaning for him or her. Try using pictures with individual words or flashcards. Young learners need a lot of support, and doing things visually will help as a bridge to move to the next level. You can also help your child sound the word out by helping him or her blend the sounds together. For example, if he or she knows the sounds in the word bus, have your child repeat the sounds over and over until he or she can say them fast enough that they recognize the word they’re saying. But I would recommend the first step would be to add picture support because it will be more engaging and have more meaning. My son is 4 and he has a very short attention span. I am having trouble keeping him interested in learning letters and writing letters because he does not like to sit for very long periods of time. Do you have any suggestions to help me? This is very typical of a 4–year–old because they’re interested in so many different things. I would say to keep activities short and interesting. Make sure your child is successful in what he does. It’s probably not best to quiz your child at this time, but build opportunities to be successful. An example of this is saying, “This is the letter C. What letter is it? You’re right, this is the letter C.” You’re not expecting the child to do things on his own, but you’re building the support for success. If they’re frustrated, stop and come back at some other time and try it in another way. If you know what frustrates them, you know you need to change it up and possibly make it into a game or an activity where they can move around and do different things. Most of all just make it fun and short. If your child isn’t ready at 4–years–old, it’s not too late. Maybe you need to wait until they show a little more interest. That’s perfectly OK too. What is your experience of how public schools can keep Kindergartners interested and challenged if they read well but are in a class of mixed reading abilities? Your child’s teacher should be doing many things to make sure each individual child is interested, engaged, and challenged. Many times a teacher will meet with students during small groups, which allows him or her to spend time determining and working on each child’s specific needs. When teachers are planning their lessons they will often–times create and incorporate activities that reach a variety of instructional levels. They may have a remediation activity planned that helps some children review and practice more basic skills while others work on skills related to something they recently learned, and others may work on more challenging activities that extend their understanding. Other times the teacher will have the entire class work on an activity that may seem basic but helps him or her determine your child’s level of understanding. Differentiation looks different in every classroom, so if you’re curious or have questions, just ask your child’s teacher. I know there are different levels of phonics. How will I know when my child is ready to move on to another level, such as the blended sounds? Children are ready for different levels of phonics instruction at different times. If your child demonstrates a solid understanding of letter names and the sounds represented by each, he or she may be ready to move on. Maybe your child knows the most common sound represented by each letter, but now needs to focus on vowel sounds or consonant letters that have multiple sounds, such as the letter Gg. Another way to tell if your child is ready to move on is their level of engagement. If they seem bored or are quickly moving through the material you’re presenting with no problem, then it may be time to introduce new concepts. However, children need constant reinforcement and practice so even if your child demonstrates understanding, you may need to practice these skills again in a couple days or weeks to ensure they retain what they learned. I use ABCmouse in my multiple disabilities classroom. The students look forward to this activity. My question is: Is it possible to create activities that are high interest but still at the beginning reading skills? Thanks! One of the easiest ways to present beginning reading skills while also ensuring that they’re high interest is to base them off of what your students enjoy most. When concepts are presented in a way that keeps children actively engaged, the concepts are more likely to keep their attention, and children will be willing to try them again in the future. For example, get your students moving. While they’re swinging, try holding up letters that they have to identify each time they pump their legs or create a hopscotch board with a letter inside each box. When they land on a box, they need to say the sound represented by each letter. Creating activities based around what your students and children enjoy most ensures they’re eagerness to participate in learning activities. Should my kindergartner know how to read before 1st grade? Do you have any books or programs you would recommend to teach phonics and reading at home? Reading development occurs at different rates for all children, however your child should be able to read many sight words, word family words, and simple three letter words by the end of kindergarten. Using their knowledge in these three areas will help them to be able to read predictable, repetitive sentences and, depending on the child, more complex sentences. ABCmouse.com has many resources for phonics instruction, and the step–by–step learning path allows children to progress from understanding basic phonics skills to becoming readers. My little boys love flashcards, but my writing is almost illegible, and the professional flash cards with pictures are their favorites. However, I have a difficult time finding them for sale. Are there any flashcard sets (words with an associated picture) that you would recommend? Flashcards are a great way to reinforce phonics knowledge. ABCmouse.com offers free printables that feature capital and lowercase letters associated with basic pictures that can be used as large flashcards. Another great option that includes your boys would be to cut letters and pictures from magazines and newspapers. Have them help you find their favorite pictures to go with each letter and involve them in the process. How early is too early to teach phonics to my child who may have disabilities? Each child is different, but use your child as the lead. If they show interest in letters, words, and books and are asking you questions about the letters, then I think they would probably be ready to learn about phonics. I wouldn’t expect that to happen too early, but it’s always good for them to be curious. I don’t think there’s a time that’s too young or too early to begin learning as long as you use your child as a guide. I’ve found in my own family that my niece was ready, but my nephew was not ready. It varies from child to child and there’s no right or wrong time. However, children should definitely be working on phonics and sight words by kindergarten. My 2–year–old loves books and wants us to read to her all of the time. She is so independent that she will read a different book at the same time she wants you to read. How do I get her to let us read to her and have her listen? It sounds as though your child is developing a love for books and reading, which is great! At 2 years old she is just learning that the symbols within a book tell a story, and because 2–year–olds have very short attention spans, it’s going to be difficult to get her to sit and listen to an entire book. The most important part is that you’re spending time exposing her to books, and she’s developing her oral language skills at the same time. You’ll notice that as she grows, she’ll be able to sit for longer periods of time and will begin to listen to the stories you read to her. Try establishing a daily story time routine with your child. Bedtime might work best. Find a quiet place to sit and read with your child. Make sure it is a place without too many distractions. To start, you might want to try taking turns reading just a page. Have her listen to a page and then try reading one herself. When it is your turn to read, be dramatic. Change your voice for each character and act out some of the actions in the story. Should a child be able to read before entering kindergarten? What are the key items children need entering K? You can start your child on the beginning learning path on ABCmouse.com, and that will help you figure out the progression of letters your child can work on and what activities are developmentally appropriate. If you’re reading books with your child at home, pointing things out at the grocery store and the park, and speaking and listening to your child, they’re going to be on the right track. Before entering kindergarten, it would be helpful for your child to be familiar with the sequence of letters of the alphabet, to be able to identify capital and lowercase letters, and to have exposure to letter sounds. Any reading and phonics skills you work on with your child prior to kindergarten will give them a head start. What is reasonable to expect (regarding the learning of phonics, letters, and sight words) from a 2½-year-old? Some young children show great interest in books and reading, while others do not, and so your expectations should match your child’s interests and experiences. In general, though, continual exposure through shared reading activities with parents and other family members will help develop a love and curiosity that’s beneficial to future reading. Also, keep in mind that with most 2-year-olds it’s best to plan learning activities that can be done in relatively short periods of time (5 or 10 minutes). And when you’re introducing a new concept, try doing it in multiple ways. You can start by playing a game, and then sing a song. The next time, try a puzzle. Keep it short and fun, and revisit the concept or skill over and over again—that’s how younger children learn best. How can I reach a child that shuts down and does not want to learn? Sometimes when children shut down it’s because they’re frustrated or the task presented is too difficult. Start first by making sure you’re presenting him with concepts that are developmentally appropriate. Then, find what interests and motivates your child the most, and use that as a guide to determine how to motivate him to learn. For example, while going for a walk in your neighborhood, have your child look for signs with specific letters or words. Make sure that your child is successful in the activities that you create for him. Start with simple activities and praise your child on his successful efforts. After a while, he will be willing to attempt new learning activities. If my child is better at math than reading should I focus on reading before math and do our math work second? There is no specific order that you need to follow. I have found that children love to have choices. It is fine to ask your child which one he prefers to do first. But, remember that learning time should be something your child looks forward to whether it’s reading, math, science, or social studies. Sometimes this is easier said than done, but by ensuring that all learning activities are fun and exciting your child will be more willing to work on those areas that are more challenging. Math may be his strength, but by creating fun and exciting reading activities your child will be eager to work on both content areas. How do I help my child learn letter sounds? When children begin to learn letters and the sounds they represent, it is a good strategy to connect letter sounds to words represented by pictures. For example, a picture of a ball can be used to teach children that letter b makes the “b” sound like in the word ball. You could also connect his learning to a motion to include the sense of touch. In this example, the child would move his hand up and down as if bouncing a ball. How do I apply this method of teaching while my kindergartner is offline? To support phonics instruction offline, follow some of the suggestions I provided throughout the webinar such as phonics memory games or letter bingo. How can I help my 5–year–old blend sounds such as “ae,” “ee,” etc. in words? Would abcmouse.com include activities in Spanish too? My daughter is a Spanish speaker, but she is now in school and has learned a lot with ABCmouse, and so have I! Many ABCmouse.com activities present many counting and vocabulary words in both English and Spanish. Continue looking back in the future for an ABCmouse site specifically for ELL children. My son is 2½ years old and knows his letters and sounds. What should my next step be with him? That’s a great start! After learning all the letters and their most common corresponding sound, children should be introduced to letters that have multiple sounds such as vowels. He should also begin to learn how to connect letter sounds to words represented in pictures. For example, a picture of an apple can be used to teach that the letter Aa makes the short a sound or that a picture of an acorn makes the long a sound. Your child may also be ready to learn common letter combinations or word families. Why is this website good for children’s education? There are so many websites, so why should we choose this for our kids? ABCmouse.com has been designed in close collaboration with nationally recognized early childhood education experts. Each and every lesson and activity offers children different ways to learn, in accordance with the recommendations of these experts. ABCmouse.com supports the development of your child and guides them to their next level of learning. With frequent updates of new books, games, puzzles, songs, and art activities, students have an endless supply of educational activities to keep him or her entertained while learning. My students have difficulty identifying the final sounds in words. What do you suggest? Try helping your students sound out simple three letter words using a movement. For example, a student can sound out the word hat by touching his arm in three different places. The student would say “h” while touching his wrist, “a” while touching his inner arm, and “t” while touching his shoulder. This simple movement will help the child connect the letter sounds to the position in the word. Also, providing many opportunities for children to work with word families is another way to help them focus on the final sounds of words. For example, when they hear words like cat, rat, sat, and mat they begin to notice a pattern of sounds. You could also try focusing on one sound at a time. Try focusing only on words that end with the “t” sound one day and try words that end with “s” the next, and so on. Another strategy is to provide your children with many opportunities to manipulate letters and sounds. Use letter tiles or magnetic letters to help them focus on the beginning, middle, and ending sounds. What would happen if they moved those letters around? With continual practice, your students will begin to identify all the sounds they hear when they read or say a word aloud. Are there any particular websites to use or look for when teaching phonics during home schooling for a kindergarten level? ABCmouse.com helps children build a strong foundation for future academic success by providing a comprehensive and engaging online curriculum to greatly assist early learners to succeed in pre–k, kindergarten, and early elementary school programs. Children can learn and explore with their parents, or on their own (depending on age and ability), in a safe and secure online educational environment. The developers of ABCmouse.com are continually presenting new content and activities so children continually remain engaged, challenged, and interested. I am a youth services librarian. What are the key ways to help parents understand and guide their child in learning phonics? Our largest patron group is birth to age three or four. It sounds like you’re in a great position to talk to parents about the importance of early phonics and reading. Since the parents you work with are bringing their children to the library and exposing them to books in a print–rich environment, they’re already off to a good start. One of the most important things parents can do prior to phonics instruction is to provide opportunities to listen to and read books. You can help parents learn fun ways to engage their children in reading and literacy activities. Storytelling, finger plays, and chants are just a few ways to get kids motivated to read. Additionally, parents should be using their child’s interests, strengths, and weaknesses as a guide to determine that their child is ready for the next step. How can I get my child to remember her letters? Thank you! Repetition, repetition, repetition! Most young children need continual exposure to new or unfamiliar concepts before they retain the information they’ve learned. Many young children benefit from visual supports such as connecting a letter or letter sound to a picture. Also, by limiting the duration of learning activities children are more willing and eager to participate again and again. Most importantly, be patient and supportive as your child is learning the letters of the alphabet, and you’ll begin to see growth. Should children be reading prior to entering kindergarten? Should I be concerned if my child is not? Children typically begin learning to read during their year in kindergarten, however it’s important to remember that all children learn to read at different rates. Some will begin reading before kindergarten and others will begin to read after kindergarten. Prior to kindergarten, your child should be showing curiosity and an interest in books and reading. There are many skills children need to know before they can read, such as the letters of the alphabet and their sounds and how to manipulate a book. Helping your child with these concepts at home will benefit your child later on as he or she begins to receive formal phonics and reading instruction. How do you teach the rules of phonics and word construction, such as silent E, diphthongs, diagraphs, etc, to a first grader? I find it hard to explain these things when they come up. Phonics instruction isn’t always as simple as blending sounds, which can make reading challenging as young readers are introduced to more complex vocabulary. Help make your child aware of the fact that not all words follow the rules, and teach them the strategies needed to read such words in the future. These “rules” can be overwhelming so only introduce one at a time. For example, while reading together, if you come across a word that doesn’t follow the typical rules, use it as an opportunity to point it out. Be sure to provide opportunities for your child to practice similar words and see if your child can find others. How can you best integrate phonics with sight words? There are many levels to phonics instruction. Before your child is introduced to sight words, he or she should be familiar with identifying the letters of the alphabet, the sounds represented by each, and they should be beginning to blend sounds when reading words. As your child is introduced to beginning reader books, he or she will come across many sight words. Sight words are often called high frequency words because they appear so often throughout sentences and books. As your child begins to read sentences, he or she will need to become familiar with such words. This would be a great time to start integrating sight word recognition into phonics instruction. I have students who can sound out a word well, but then when they say it fast, they leave off the beginning sound. Can you give me some suggestions on how to help them? We need to teach children to always ask themselves “Does this make sense?” If it doesn‘t, they need to learn to go back and start over. This is something we can model and guide them in doing. Ultimately, they need to learn to do it on their own, but by modeling and instructing, they’ll be able to monitor the meaning of their reading. Another strategy would be to have them try tapping the sounds out as they read. Have them tap each time they say the sounds represented by the letters in the words. If they tap four times while sounding out slowing, they know there are four sounds they should repeat the next time they sound it out a little faster. This strategy will help your students remember to include all the sounds as they’re blending the sounds quickly. I have a student who knows all letters and letter sounds. She can decode words slowly, and can spell some words when she hears the “stressed” individual sounds. Her struggle is writing the letters in the correct order. What do you recommend to aid her in writing letters as she hears them? This is a common struggle for young children who are beginning to spell, and it’s important to remember that your students will need frequent opportunities to practice this new skill. It is also important to note that children usually go through stages of learning how to write as well. Many children will begin to write by recording just beginning sounds of words. Next, some children progress to beginning and ending sounds to represent a word. Finally, children reach a stage where they can write a word phonetically by recording all the sounds they hear. Determine where your student is at, and patiently guide her to the next level. If you believe that she is ready to write words phonetically, start with simple CVC words. Model for your students how to sound out a word before writing. For example, if you’re writing the word cat, make sure you clearly separate the beginning “k” sound, the medial “a” sound, and the final “t” sound aloud. Do this several times before you begin writing. As you say each individual sound slowly, write the corresponding letter. You can also try using a guide that includes three boxes or lines to write each letter in. Modeling the writing process will help your students focus on the beginning, middle, and ending sounds and understand that they must take the time to hear each sound before writing the letters.